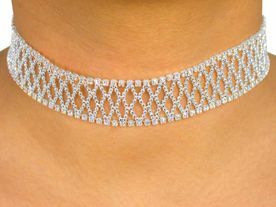 Beautiful, Lifetime Silver Tone Plated Choker Is Designed In A Faceted, Stacked Diamond Ball Chain Pattern Trimmed With Genuine, Glittering Austrian Crystals! Necklace Includes Matching Pierced Earrings! Necklace Measures 11" Long Plus 4" Extender. Earrings Measure 3" Long x 7/8" Wide.